Create album with lunch sacks by folding 3 sacks in half, score folds, and punch 5 holes 1/2 inch from fold on each sack.Ink edges.Layer sacks and fold to create 6 pages. The binding over the fold is made of cardstock that is 1 1/2 inches wide and 4 1/2 inches long. Tear vertical edges of fold cover,fold, score, punch 5 holes 1/2 inch from fold, and ink edges. Adhere fold cover to fold matching holes and machine sew around front of album (top sack only) and fold cover. Tie sacks together with ribbon. 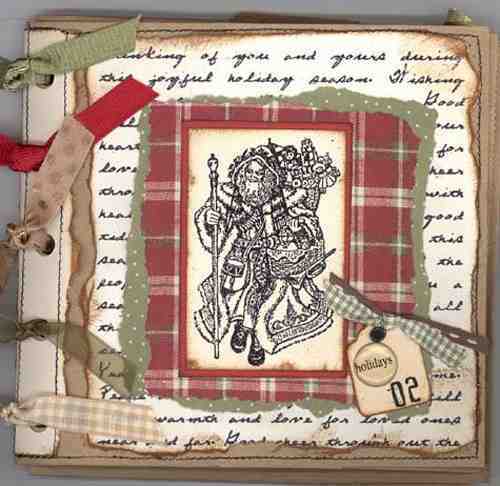 Stamp Christmas writing on cardstock with Versamark, emboss, tear to 4 1/2 x 4 1/2 inches, and ink edges.Adhere to front of sack album.Tear 3 1/2 inch square of pattern paper (dot) and adhere over embossed writing. Tear 3 1/4 inches wide square pattern paper (plaid) and adhere over dots. Stamp Santa on cardstock with Versamark, emboss, trim, ink, and adhere to 2 7/8 red square cardstock. Ink cardstock. Adhere on plaid. Ink small tag, tie ribbon on tag, place brad, domed word, and date sticker on tag. Adhere tag to cover.